They are perhaps the most iconic animals of the Ice Age. But woolly mammoths survived in North America an astonishing 6,000 years after the Ice Age ended, scientists say. On a remote Alaskan island known as St. Paul, a tiny population of the mammoths managed to persist until just 5,600 years ago, according to new research reported in the Proceedings of the National Academy of Sciences. A team of paleontologists and earth scientists reached this conclusion after studying newly found mammoth remains from the island, and also investigating the impact that the animals’ presence — and their disappearance — left on the island. “It’s amazing that everything turned out so precisely, with dating of extinction at 5,600 plus or minus 100 years,” said Dr. Russell Graham, Penn State geoscientist and lead author of the study, in a press statement. St. Paul Island was already known as one of the last strongholds of the woolly mammoth, the team pointed out. Mammoth remains were first found there in 1999, and radiocarbon dates of those bones revealed them to be surprisingly recent, at 6,500 years old — 4,000 years after mammoths had vanished from the North American mainland. But Graham and his colleagues found that the megafauna lasted for nearly another thousand years on St. Paul, as shown not only by the animals’ bones but also by the environment in which they were found. 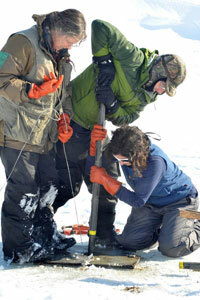 In 2013, Graham and this team drilled cores of sediment from a shallow lake on the island, looking for microscopic clues to the mammoths’ presence. Among the most useful evidence: poop. Scientists can estimate when and where mammoths and other large animals lived, by the presence of microscopic fungi that feast on their feces. And an analysis of three species of feces-eating fungus showed that the number of the fungi’s spores — and therefore, of the mammoths — dropped sharply about 5,600 years ago. “We see a reduction in the three species of fungus, all of which are associated with the dung of large animals,” Graham said. Another line of evidence in the mammoths’ disappearance came from an even smaller source: sediment DNA. Even when fossil remains themselves can’t be found, scant genetic traces of ancient organisms can remain trapped in layers of sediment, known as sedaDNA. And here, too, 38 separate cores from St. Paul’s lake showed that levels of mammoth DNA remained stable on the island until it suddenly vanished about 5,600 years ago. “Mammoth sedaDNA is present in all tested sediment samples between 10,850 years ago and 5,650 years ago, and absent in samples younger than 5,610 years ago,” the team writes in PNAS. As for what finally wiped out the remarkably hardy population that would be North America’s last woolly mammoths, the usual suspects were quickly eliminated. Similarly, there’s no record of polar bears — the other most likely predator in the region — appearing on the island until at least 1,000 years after the last mammoth died. So instead, researchers believe, the culprit was climate. 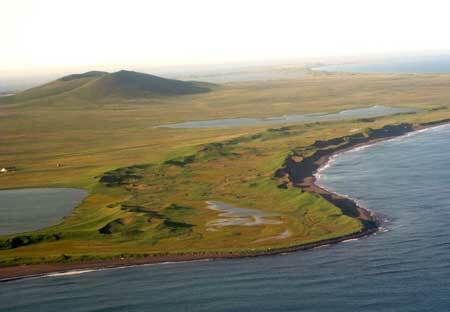 St. Paul Island was once a stretch of high land within the Bering Land Bridge, which connected Asia and North America during the Ice Age, when sea levels were substantially lower. But as the climate warmed and ice thawed about 14,000 years ago, sea levels rose, gradually trapping St. Paul’s population of mammoths on a slowly shrinking island. And as seawater encroached on the island, one resource came in increasingly short supply: fresh water. Evidence like plant fossils and pollen found in the cores reveal a drop-off about 5,600 years ago in pollen from shrubs and tundra plants, indicating a drier environment. 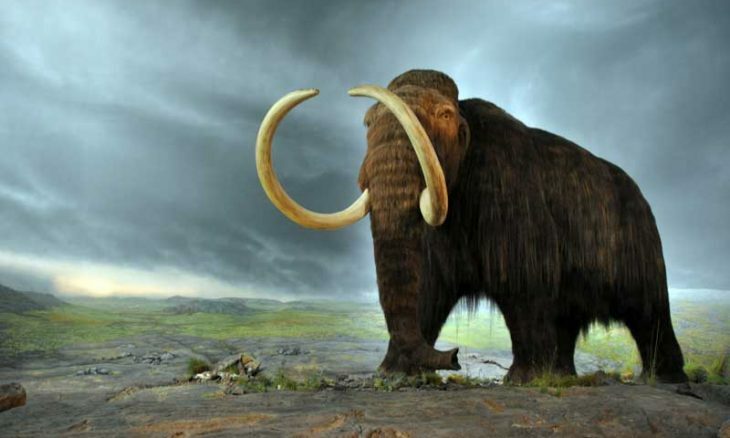 “It paints a dire picture of the situation for these mammoths,” said Matthew Wooller, director of the Alaska Stable Isotope Facility at the University of Alaska Fairbanks, in a separate press statement. Article #16-04903: “Timing and causes of mid-Holocene mammoth extinction on St. Paul Island, Alaska,” by Russell W. Graham et al.